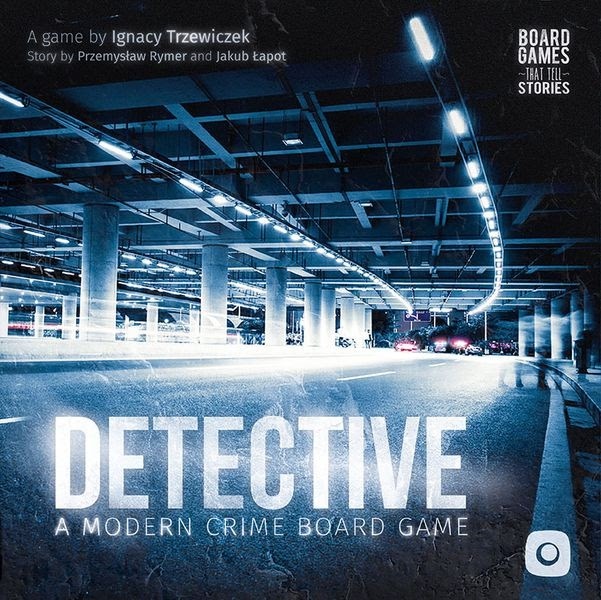 Detective: A Modern Crime Board Game pits you against a pre-determined story where you and your gaming buddies uncover clues, deduce events and find evidence to prove your theories across 5 inter-linked cases. The game is more structured than Sherlock Holmes: Consulting Detective, coming with a board and some pieces to track the flow of time and abstractly, your location. Each case has a deck of mostly double-sided cards which may provide more leads for your investigators to follow and hopefully will gradually reveal the crime. Your decisions determine which cards i.e. evidence are revealed to you. At the end of the game you must 'write' a final report. This consists of answering a number of multiple choice questions about the case which determine your final score. This is automatically done by the Antares Database, which is a major resource for finding case information, matching evidence and tracking your progress through the 5 cases. A few years ago I remember there being much more of a fuss made when boardgames required the use of a companion app to play. I think those concerns have now either disappeared or succumbed to the onslaught of technology. This game doesn't provide an app as such but it does require an internet connection to access the Antares Database. It is also very useful to search online for the context of significant events and places that are revealed to you. This hybrid use of real-world information and game information provides you with a real sense of being a police investigator and cleverly immerses you into the story that unfolds through each case. Prior to starting play each player and the unused consultant investigators will pool their abilities which can be used once per day, these abilities often will allow you to 'dig deeper' or press someone in an interrogation. This may reveal a major plot point or be a dead-end, the decision of what to do is up to the players to discuss. However, any decision to act upon the current card must be made before any other card or activity is done. This provides a real sense of jeopardy to your decision; if you don't do it then you'll probably never know what could have been revealed. When you do collectively decide to 'dig deeper' you often will read a new card or turn the relevant card over onto the back-side. As you progress through the case any cards you've read are kept out of the deck, these cards can be reviewed at any time however you're not allowed to read the back-side of cards unless you've been explicitly told to e.g. by digging deeper. Those you're allowed to fully read are kept to the left of the board and those you can only partially read to the right. Although this is nowhere near a legacy-style game, the cases are linked by a single story arc and the evidence and clues you find in earlier cases do affect later cases. 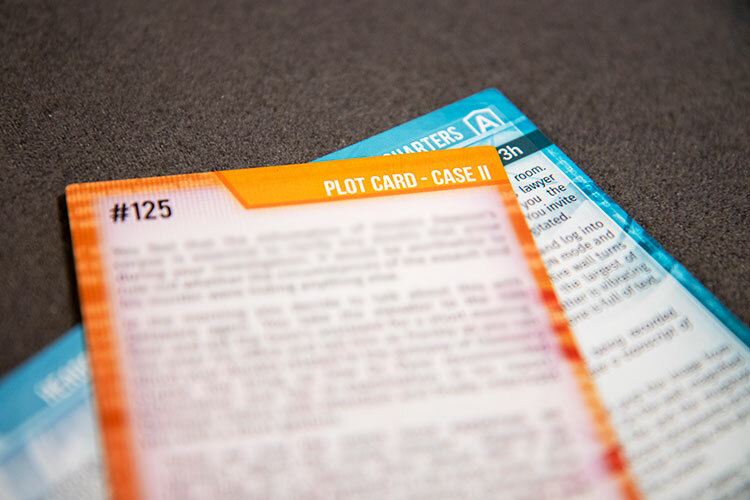 This is handled by the use of plot cards being added to later cases which are reviewed prior to starting the next case (if you've revealed any). The rulebook recommends the use of mind-maps and white-boards to keep notes of important clues. I thought a piece of paper would be fine, I was wrong. Keeping notes is a vital part of this game, and the notes from an earlier investigation will also help in later cases. This really helped me to feel part of a detective squad with the other players, normally I had just 1 other player with me but for the 4th and 5th cases I played with 3. Unfortunately, if you've not played the earlier cases you're not going to feel as involved as the cases all build upon each other. However, the newcomer to the fourth case still enjoyed it and came back for the fifth case so it can be done but I would recommend, as does the rules, that you play the cases from 1 to 5 with the same group of people. The final thing I want to say about the gameplay is that your actions all have a time cost associated with them. Revealing a new card often entails travelling to a new location on the board which always costs an hour and the card themselves have a variable time cost as well. This quickly eats into your work day which is tracked on the board and completing 3 or 4 actions in a day will necessitate overtime, tracked through stress tokens. All of these gameplay elements are very simple, easy to understand and thematic. It's very easy to explain to others, in fact, I think the best explanation may be to just start playing, new players will quickly pick-up and take-over the mechanics as they're so well designed to stay out of the way as much as possible. This game is friendly to non-gamers as much as it is to gamers and although I've played it through, I'm keen to introduce it to some of my family who do not play games regularly. To show you how excellent the components are, the only criticism I have for them is that the 'evidence bags' the case cards are meant to fit into are very snug and could lead to damaged cards if you're not careful. The rest of the components are all top-notch. The artwork across all the cards, boards and rule-books have a thematic CSI-feel to them. The rule-book and case-book are clear and well laid out. I had no issues with the story-writing (which has been raised in other forums) nor did I have any rules questions - it's a mechanically very simple game but the challenge is all in the story. You won't like this game if you're not comfortable reading in front of others. There is a fair bit of text to get through and each player, in my experience wanted to see the cards and read any text for themselves, not necessarily immediately, but on some decision points everyone wanted to read the text. This trait could/does slow down gameplay with more players. It is a bit challenging to drop in and out of this game as a player; you realy should keep the same group of players together for 5 sessions to really get the most out of the game. My recommendation is that 1-3 players is the sweet spot. I did play the first case as a solitaire experience to understand the gameplay before I replayed it with my friend and two heads are definitely better than one in this game. Once you've played the game 5 times, you're done. You can't really recreate the same experience as you already know the answers or will be prompted to remember crucial plot points without investigating them. The severely constrains its replayability. This is an excellent addition to the detective story-telling genre of games. I personally preferred it over Sherlock Holmes Consulting Detective primarily because it is more structured in terms of gameplay and the hybrid mix of the database and internet-use really added to my sense of being an Antares Investigator. Although if you've got that earlier game as a frame of reference I would say that this is an easier game. The value of this game easily matches the price of the box and I would readily recommend this game to anyone with a consistent but small group of players. This game is crying out for expansions and I am pleased to see that there are expansions in the works. The first has already been announced by Portal Games involving 3 new cases, linked as the first 5 were, but as I understand it completely separate from the first 5. I would like to thank the distributors for sending this game for a review.